Twitter: Criticize Anita... you're GONE! The banning of differing views on social media. Because if you can't force someone to agree with you, silence them. Cardinal Rodríguez, Papal advisor, had some strong words on Tuesday for capitalists and believers in classical liberalism. "Those who criticize the pope do not know the rest of the world"
Libertarian ideologies, Rodríguez said, have a "limited perspective of the reality, according to particular interests." "Libertarianism has ... an anthropology that is reduced to individualism, cutting the social dimension that is also part of the constitution of the human being," he said. "It is impoverishing humanity. Because the rest of the people are like objects I can use, but they're not really persons to relate with." But at least he doesn't think Libertarians are bad people, just misguided. This is why secular publication Secularite needed fewer Socialists on staff and more fiscal Conservatives. A lesson for future secular organizations to take to heart. The iPad/iPhone magazine folded after four issues with this message to it's paid subscribers. Court holds sign censorship unconstitutional. Whose sign is it anyway? It seems that when a law is "not narrowly drawn to satisfy a compelling government interest,"you often have grounds to have it declared unconstitutional when it's abused. Are atheist and secular publications in the broader atheism community inherently biased toward the Progressive Left? 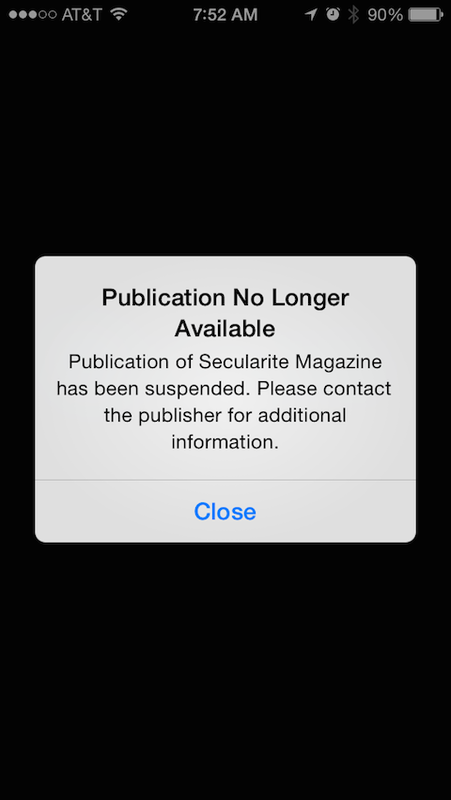 I was perusing issue two of the Secularite Magazine and once again was struck by the content I have subscribed to. It isn't as if I don't go out of my way to read opinions that I disagree with. If you can't speak in defense of or in promotion for an issue that you disagree with, you don't understand it well enough to advocate against it, after all. I rarely provide these opinions financial support, however. PROVISIONS OF THE PATIENT PROTECTION AND AFFORDABLE CARE ACT - in which the 'benefits of' gets approximately twice the column inches of the 'costs of' side. MARTIN LUTHER KING JR: AN ADVOCATE FOR EQUALITY AND SOCIALISM - in which the author ties in King to the Socialist Party's principles. SKEPTICISM: FOR POLITICAL ACTION, NOT JUST SCIENCE - in which the author pushes for collective action, non-profit organizations to become involved in the electoral process, a favorable comparison of Occupy Wall Street verses the Tea Party (two groups I personally don't consider politically very dissimilar); all in service of avoiding the equivalent of Bigfoot skepticism. WHAT IS SOCIALISM? - in which we find out the term libertarian was stolen from right thinking nineteenth century socialists/anarchists by 1970's American Conservatives. So, five out of the ten articles seem to expose a strong political leaning biased exclusively toward the Left. Very little in the way of a balancing opinion is allowed to surface. I would have expected to have seen more balance if I had subscribed to the Nation Magazine or tuned into MSNBC durning evening prime time. Fox at its worst makes a passing effort to get a few words in from opposing political agendas. Are we actually worse than Fox News Channel in the echo chamber that we are constructing around ourselves? Are we, or more precisely am I, being forced out because of political viewpoints which should have little bearing on the secular community? Is it even worth attempting to fight to merely be acknowledged as existing without being disparaged in the next breath at almost every turn? Fox on freedom of religion. This is known as winning! Fox Business Network show, The Independents, discussed the Oklahoma Satanist Monument and freedom of religion Tuesday night.